From large commercial projects to residential needs, All Fence Company, Inc. has the resources and experience to handle the job. 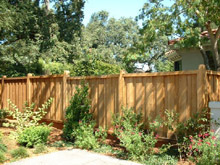 All Fence Company, Inc. warranties all workmanship on projects for up to 10 years. This warranty is transferable if the property is sold. Our affiliations include The Better Business Bureau (BBB), The Redwood City and San Mateo County Chambers of Commerce, The American Fence Association (AFA), and The California Fence Contractors Association (CFCA).